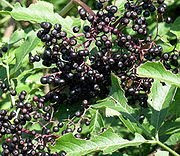 Elderberries, aka Sambucus or Elder, are now everywhere and if you are really fast (and lucky) you can beat the birds to them and make lots of delicious drinks and food. Over the next few days I will post lots of elderberry recipes for various things, so that we can all make the most of nature's free food. Elderberries contain huge amounts of vitamin C, and are a very old traditional remedy for colds and viruses in many countries. The old ways are often some of the best ways. Remember though to never pick all the berries from a bush or an area, as the local birds also rely on the elderberries as a very valuable source of food at this time of year. Another thing... Try not to pick the berries from alongside a busy road or in a town, as these will be full of toxins and chemicals pumped out from car and lorry exhausts. Disgusting and somewhat poisonous ! 1. Pick the elderberries on a dry day. Make sure all insects and mouldy berries are discarded. 2. Stew the berries in a large covered stainless steel saucepan, with just enough water to cover the berries. This will take about 45 minutes. Stir occasionally, but keep covered so as not to evaporate the juice.